Here’s What The Doctor Who Companion Thought of The Lie of the Land! Truth or consequences? No, wait, that’s a different one isn’t it? I don’t know, aliens these days – always imposing their own “truths” on us mere mortals. But did the rest of the DWC Team agree…? 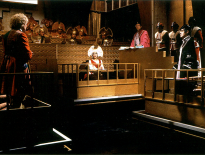 Whilst The Lie of the Land started off with great promise and more than one or two nods to Last of the Time Lords, it ultimately became a predictable plod from the moment the Doctor ‘snapped out’ of his faked regeneration. The Doctor’s laughter at crashing a ship into a harbour felt oddly forced and niggled this viewer somewhat, the Monks really didn’t think to put much security near their base of operations, whether or not your numbers are small always guard the important stuff during an invasion of Earth. Bill’s mother being the catalyst for the defeat was glaringly obvious from the beginning and the less said about the ending the better. Actually let’s mention it – after three weeks I expected a Doctor / Monk face-off, a heroic Doctor style victory speech, and a huge Doctor Who explosion, not a hasty retreat. All that meticulous pre-planning in VR and the Monk didn’t have a plan B, C or even D? Thankfully the scenes between the Doctor and Missy were gold, the Master being rehabilitated by the Doctor has long been on this viewer’s Doctor Who tick list, and Lie of the Land paid dividends in this respect. There’s a palpable tension in the air that Missy may well be lying about her apparent ‘turn to the good side’ but the Silence of the Lambs style play outs in this episode serve as a testament to Capaldi and Gomez’s remarkable turns in character. This is an odd miss for Toby Whithouse; for all the strong scenes included there are more disappointing moments that could have been better. Despite odd pacing and some concerns over the structure, I really enjoyed this one. For the first 20 minutes, I just enjoyed dystopian Britain and felt overall Bill had some great moments, even if a lot of what went on could be viewed as padding. 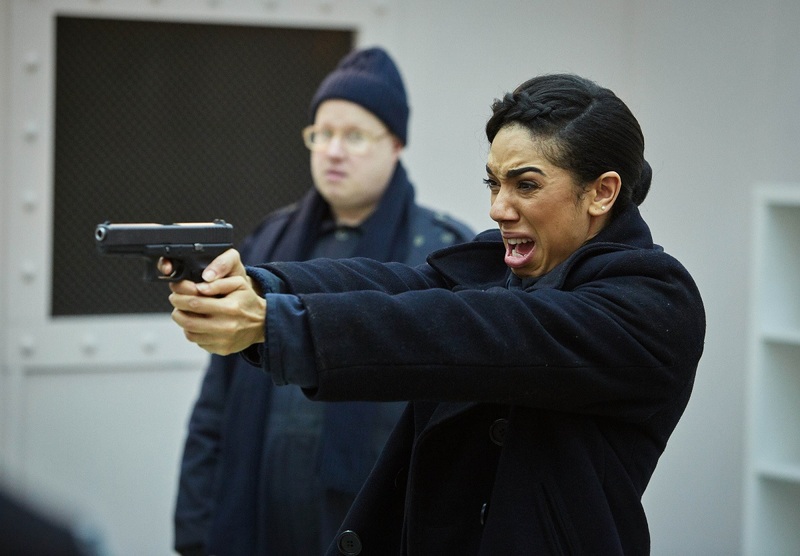 Missy was in good form, and Nardole is fast becoming a favourite. Yes, the story was clunky; yes, the ‘we all forget’ ending is overused, but Lie of the Land won me over right from the start – that’s no bad thing. I did agree with the Doctor: the fake regeneration was a step too far. 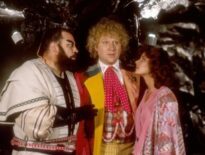 Returning last week with the end of the ‘Monk trilogy,’ Doctor Who ended its most recent three-parter on a middling finale. Don’t get me wrong: the production, headed by new director Wayne Yip, was first-rate​. The visuals, the presentation of a dystopian world and the set-up to the episode were lucid and exceptional. But Whithouse’s story failed to deliver a convincing conclusion to the Monk’s occupation of Earth. The result was a final act that was as hokey (defeating an occupation with a daughter’s love) as it was illogical (i.e., the Monks not anticipating this in their simulation runs, or, at the very least, keeping Bill under surveillance). Ultimately, the weaknesses in the episode’s final parting minutes undermined its opening act. It would be difficult to grade any episode however good with anything above a “6/10” with a resolution like that. What were they thinking!? Certain things about The Lie of the Land grated. The structure is off, somehow, as if this were a very good two-part story crammed into 42 minutes, because the Monks had taken up two episodes already and they couldn’t stretch to another. Its voiceover is cloying and unnecessary: it is, to all intents and purposes, the Blade Runner of Nu Who, and it is only in the final reel that its purpose becomes apparent, Bill’s mother becoming not just a convenient expository sounding board but also a crucial plot device. The whole thing is very Rings of Akhaten with the same wind machine they used in The Pilot but you can, at least, understand why we’ve had to put up with half an hour of interior monologue. There is an awful lot of decent material this week, even if it isn’t always used as effectively as it might be. The opening montage, which openly parodies Forrest Gump, is nothing short of marvellous, particularly with the addition of Capaldi’s soothing voiceover, bookended by the most sinister of grins. 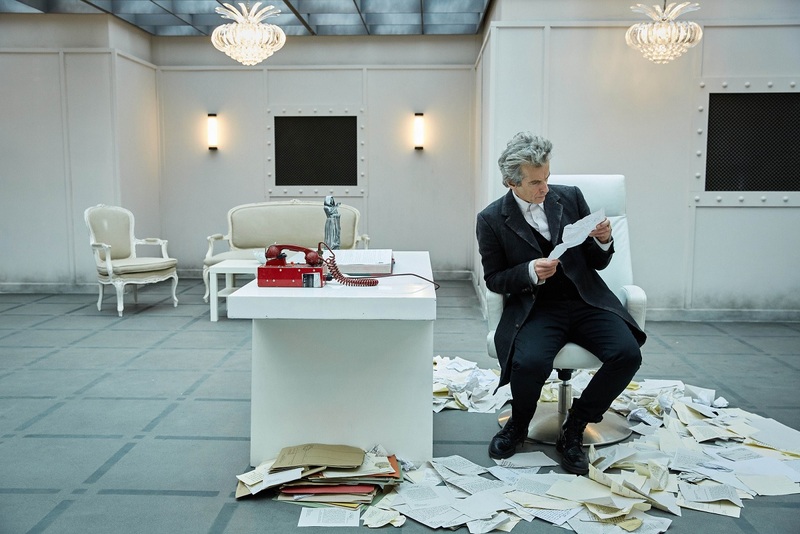 Capaldi, indeed, is absolutely the best thing about this week, whether he’s comforting a suddenly remorseful Missy or – in the episode’s high point – explaining his apparent change of heart to an incredulous Bill with such fortitude that for a second you’re almost prepared to believe it. 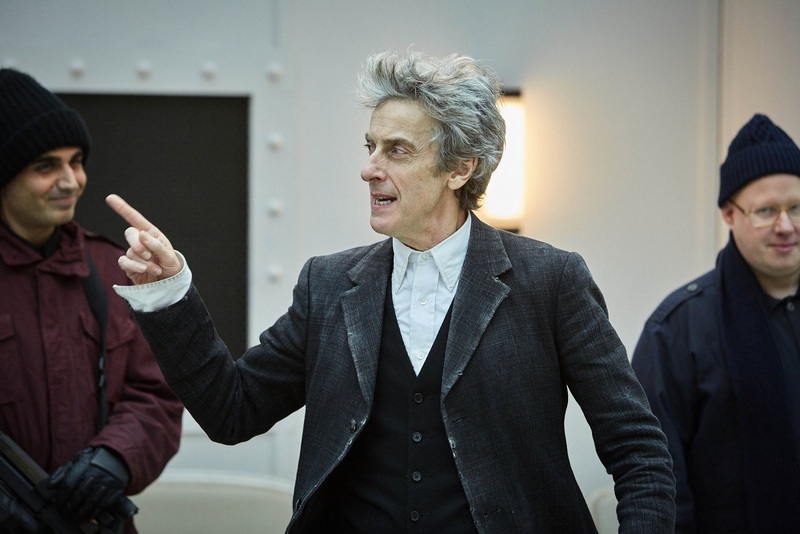 Unfortunately, it’s a that scene concludes with a mildly ridiculous denouement, and a quite unnecessary regeneration from the Doctor – “A bit much?” he quips, mostly through the fourth wall, and thus confirming that the whole thing was more about deceiving the audience than it was about winding up Bill. But the voiceover isn’t the only thing that jars. The society Whithouse creates is frightening and oppressive and reasonably convincing, but there frankly isn’t enough of it: fascist police states are encapsulated in single, cliche-driven boot-in-the-door scenes (first they came for the communists, and I did not speak out), where non-conformists are dragged away in full view of disapproving neighbours. How much more might we have benefited from a more comprehensive overview of those who rejected the Monks’ programming? The resistance movement, and the laughing men behind the guns that served under the Doctor? The figureheads in charge, kowtowing to the will of the Monks, struggling to remember a time when they succeeded or failed purely on the whims of political ambition? Even the Monks themselves, who linger in the background this week, motives untapped, barely uttering a word? How much better, indeed, might the story have been had it begun with the planet under a state of siege, with flashbacks to key moments from the Pyramid episode and all the ephemeral dialogue from last week scattered to the ashes and replaced with something a little more substantial? We’ll never know, but it doesn’t stop me wondering. The Lie of the Land was a thoroughly enjoyable episode, and its exploration of so-called ‘Fake News’ was timely to say the least. 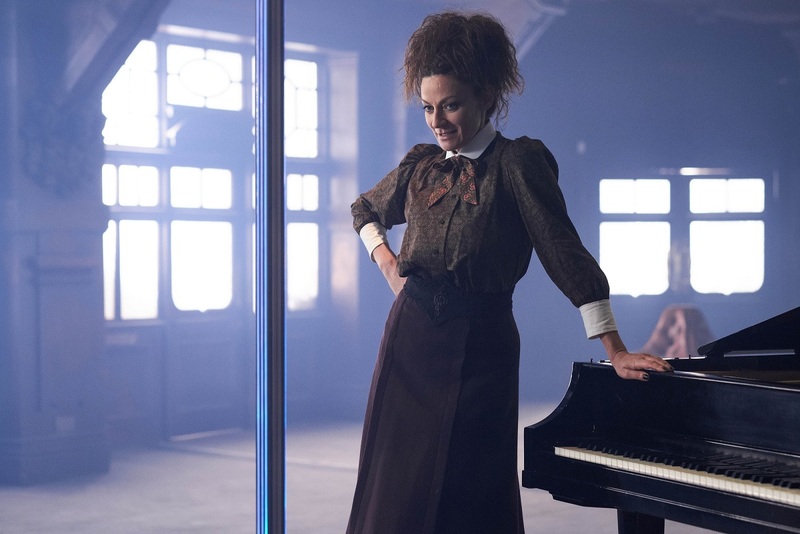 Missy was fabulously bonkers as usual, but seems to have had a suspiciously quick change of personality from her usual evil self (she was still evil enough for me in this episode), which undoubtedly means something’s up, but we’ll have to wait and see what. 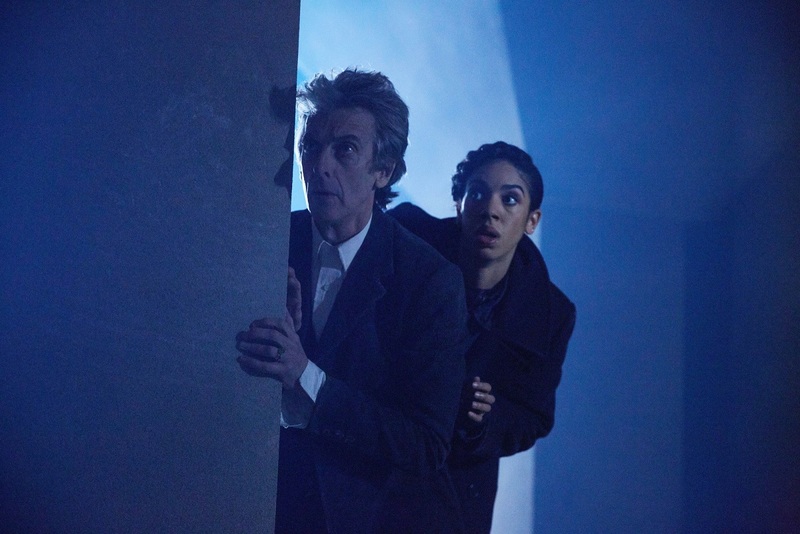 I much preferred the first part of the episode, involving Bill’s confusion and her journey with Nardole to find the Doctor, than its conclusion. Pearl Mackie confirmed (not that she needed to) how utterly brilliant she is in the part of Bill Potts, and as an actor in general, in this beginning half, and the Doctor’s misleading of her as to where his loyalties lay had me starting to doubt the character’s state of mind, making this yet another success for Capaldi also. Oh, and that sudden ‘regeneration’ was a thrilling moment, and a very welcome surprise in a series that has had nearly all of its excitement ‘spoilered’. This was the regeneration scene from the series trailer that we’d all assumed was taken from the now very highly anticipated finale, The Doctor Falls – a misleading spoiler that magnified the impact of the scene in its actual location in The Lie of the Land. However, it felt like there was something missing from the story, although I can’t quite place what it was. Perhaps it’s that it felt very much the concluding episode of a multi-part story, rather than a tale in its own right, or that once the whole episode had played out, it became clear that most of the story had been filler, a means to an end. But that’s not to dismiss Toby Whithouse’s solid scriptwriting, I’m thinking more about repeated viewings. Overall, though, this was a fitting conclusion to a second fine example of the new Steven Moffat-engineered style: the Doctor Who loose-linked trilogy (see Face the Raven/Heaven Sent/Hell Bent). A rather confusing end to a rather confusing trilogy. Perhaps the outcome of trying to balance out three writers in one arc, but regardless of the reason, this episode fails to deliver a satisfying resolution – or even a satisfying beginning to the Truth Monks. I felt no closer to understanding the “rules” to this antagonist which seemed to shift per story. The story itself felt predictable and recycled, appearing to rely heavily on the model presented in Last of the Time Lords, where a companion, left alone after a period since the previous story, seeks to save the Doctor from the enemy – and eventually resolves the crisis through global networked emotion. Familiar? Nardole’s humour felt out of place, and certainly a character whose humour should come from his relationship with the Doctor, not one-liners. I also wondered what happened to the TARDIS given he was in it; I’m sure it could have been quite handy through this escapade. The Doctor’s regeneration, used to stir up buzz in the show’s promotional material, was extremely unsatisfying. In fact, that whole scene was a bizarre bubble of meandering ideas that continued oblivious to the Monks who were said to be on board. Way to de-power your principle antagonists! This trilogy has had none of that magical confidence and flow of the earlier stories in this season, relying on old self-important gestures such as the use of the Pope and World leaders in the previous stories and the super-companion here. Great shame. I’m struggling to see past that horribly misjudged moment when Bill not only raises a gun on the Doctor but proceeds to pull the trigger multiple times… That just felt wrong in so many ways. Other than that – well, what did the monks want exactly? And having gone to all that trouble to create a virtual world duplicate of Earth and everything that ever happened to it in history, didn’t they give up a bit easily? Oh, and I can’t have been the only one who found it all very reminiscent of Last of the Time Lords. Moan, moan, moan, eh? 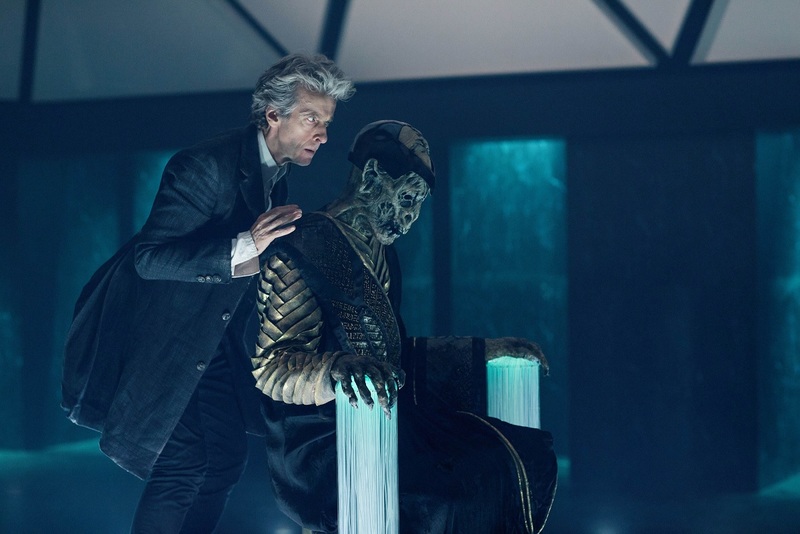 A shame, as the premise of the episode was an intriguing one and Toby Whithouse always brings engaging ideas to the show, but I can’t help feeling relieved that this rather stodgy three-parter is over as we head into the final stretch of Series 10. This episode, more than any other of Series 10 so far, shows the lack of thought that seems to have gone into it. Don’t get me wrong, it’s still an enjoyable season, and Bill is always a delight, but I’ve never had so many ‘wait a second…’ occurrences in even a single episode before this. It all comes down to the false regeneration. I get that it’s essentially shoved in there as a marketing gimmick to get people talking. Fine. But it actively hurts the story. The first thing I thought when I saw that was ‘if he can do that, why can’t he fix his own eyesight?’ That realisation ruined the whole episode for me. If they didn’t bring it up, I wouldn’t have thought about it. Then there are the Monks who can manipulate time and history itself, yet are dismissed by some woman’s mum. The ones who mapped out the entire world in a simulation, yet still lost in a worryingly easy way. 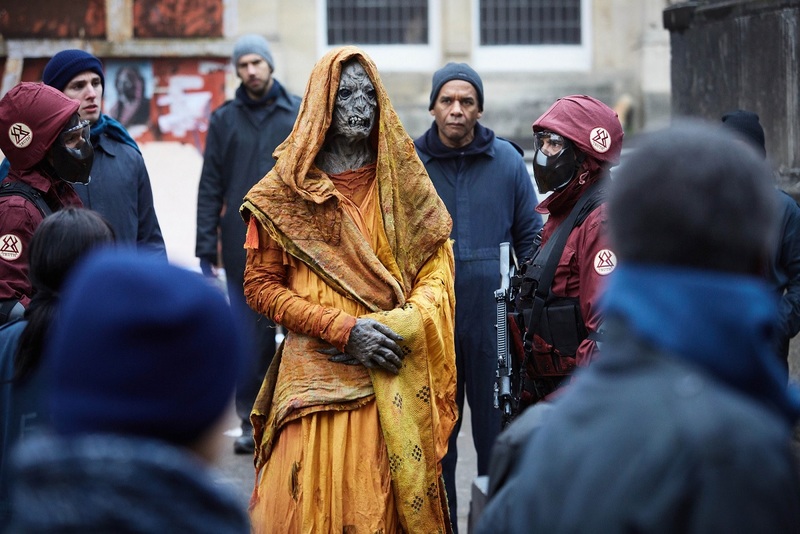 Given that this episode doesn’t really touch on Extremis (though the theme is broadly similar), it just proves that we didn’t need that episode at all. The more I think about Series 10, the worse it gets. The worst part is, before this three-parter, I was utterly on board. This was a disappointing finale to the first six parter (Yeah, I know 3 parter in 2005+) in ages. I thought it had a great set-up, a decent enough middle part, and then the Monks were… well, not just in the third part at all – not as characters. I mean the spectre of them was in the story of course, but they weren’t really active characters as such. I didn’t hate the episode as such, but it felt wildly unfulfilling. My wife and I both loved the bit about Bill and her mum. As my wife just lost her father about two years ago, the aspect of still talking to her mom hit home to my wife. I also loved the comedy in the “Fake Regeneration” scene. That vetting of Bill really reminded me of the vetting that Roj Blake did of bounty hunters in the final episode of Blake’s 7. Finally, am I the only one who thought of the Monoids from The Ark when they showed statues of the Monks? Based on that, The Lie of the Land is the worst-received episode of Series 10 so far, sadly. But I still feel it had a lot going for it, and that negative feedback is as a result of the “Monk Trilogy” as a whole. A massive shame. ← The PodKast with a K at the End of the World!